Brook trout is a fish, belonging to the Salmoniformes order and Salmonidae family. It is also known as eastern brook trout, speckled trout and squaretail. A migrating population of the species inhabiting the Lake Superior is called coaster trout or simply ‘coaster’. 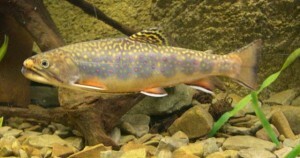 Brook trout is a highly popular game fish due to their large size. Size: Adults grow between 10 inches and 26 inches (25 cm and 65 cm) in length. Weight: They generally weigh from 0.3 to 3 kg (11 to 112 ounces). Body: Their elongate bodies are slightly compressed laterally. Head: The trouts have a large head with rounded snouts. Breeding males may develop a hook at the front of their lower jaw. Color: The basic coloration can range from green to brown with a typical marbled pattern of light shades. This special pattern is known as “vermiculation” that runs along the flanks and back of the fish, extending to their dorsal fins and tail. They also have small red spots, circled by blue, along their flanks while the reddish lower fins have white edges. The fish has reddish belly with that of the males turning a distinctive shade of red or orange during spawning seasons. Tail Fin: The characteristic squarish tail fins are sometimes slightly forked. This species is native to the eastern regions of North America. They are usually found in high elevations with their distribution range extending from the Appalachian Mountains in the south to the northern parts of Georgia and Canada. The eastern distribution range extends from Hudson Bay basin to upper Mississippi River, Great Lakes–St Lawrence system and Iowa in the west. They prefer freshwater creeks, spring ponds, lakes and small streams where the water temperature ranges between 1°C and 22°C (34 °F and 72 °F). 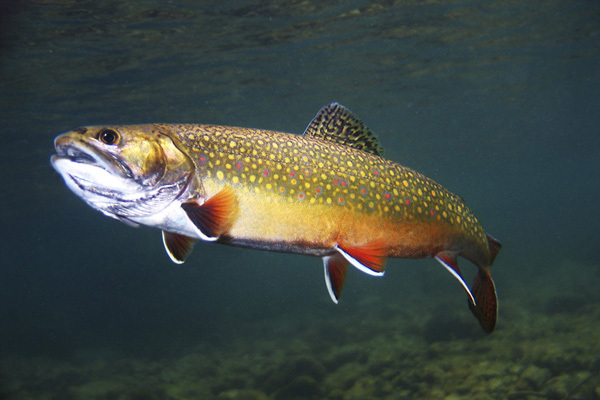 Brook trout generally inhabits clear water with pH ranging from 5 to 7.5. These carnivorous fish feed on various smaller fish species, insects, crustaceans, mollusks and other invertebrates. Their diet may also include small amphibians like frogs and aquatic mammals like voles. They are also known to occasionally feed on their own eggs and even the juveniles. Young fish of this species feed on small insects. These trouts are most active during dawn and dusk. They tend to spend the midday hours in deeper waters as they prefer proper overhead protection during these hours. Despite being generally cautious and timid in nature, brook trouts are considered aggressive predators. 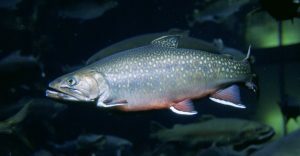 Some populations of brook trout are known to migrate to the sea during spring and remain there for about three months. The migrating populations, known as “salters” or “sea run”, always remain within a few kilometers of the river mouth during their migration to the sea. The lack of large predatory fishes within the habitat range of this species leave them without much threat in water. However, large brown trouts are known to prey on them. Various fish-eating birds, such as herons and kingfishers, also hunt them. Other predators include snapping turtles, raccoon and otters. They are able to remain in deep and cold waters for long periods of times, making it difficult for predatory birds to reach them. The ability to adapt to both fresh- and saltwater allows certain populations to move to the sea when the water of their pond habitat becomes too warm for their liking. Their breeding season starts around the later parts of summer and continues through autumn. Both the males and females become reproductively mature once they reach 1 year of age. The species is known to breed once every year with specific spawning location requirements. They spawn in the sandy or gravelly areas at the bottom of water bodies. An underwater spring or an area where water is passing through the gravel or sand is the most important natural requirement for their breeding. The females build a spawning bed or “redd” using their tails where they lay the eggs so the males can fertilize them. Female brook trouts lay 100 to 1000 eggs depending on their size. The eggs take 95 to 100 days to hatch. The young trouts leave their parents shortly after birth, taking shelter in small streams and creeks to avoid being preyed on by large fishes. Sometimes, the juveniles leave their pond habitat (when they are a little old) to move into marine waters. Its average lifespan ranges from 5 to 7 years. This species is not listed in the IUCN conservation status. However, their populations are monitored regularly by wildlife conservation groups like the US Forest Service and Trout Unlimited. Various local wildlife associations are also taking measures for monitoring their habitats as well as their health as these fish are often attacked by diseased and parasites like gill lice. These trouts are often used for various edible purposes for their high nutrient content that includes sodium, calcium and vitamins. Despite being called a trout, this is actually a char species along with bull trout, lake trout, arctic char and dolly varden. The largest recorded member of the species measured 33 inches (86 cm) long and weighed 14.5 lbs (6.6 kg). The longest living specimens were found in some California habitats and were recorded to be around 15 years old. At least 230 out of 1500 lakes located in the Algonquin highlands contain native populations of these trouts. Brook trouts are often considered an indicator species because they are among the first aquatic animals to decline in case of any disease or damage to their habitat.